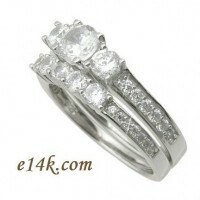 Sterling Silver 1.50 cttw Round Brilliant CZ Three Stone Engagement Ring & Matching band! 0.50 Carat Round Brilliant center stone with 2- 0.25 ct side stones & several pinpoint accent stones ... in Sterling Silver! Matching fitted wedding band included. Solid Sterling silver Jewelry piece!